A new law signed by President Trump on Wednesday allows terminally ill patients access to experimental drugs. 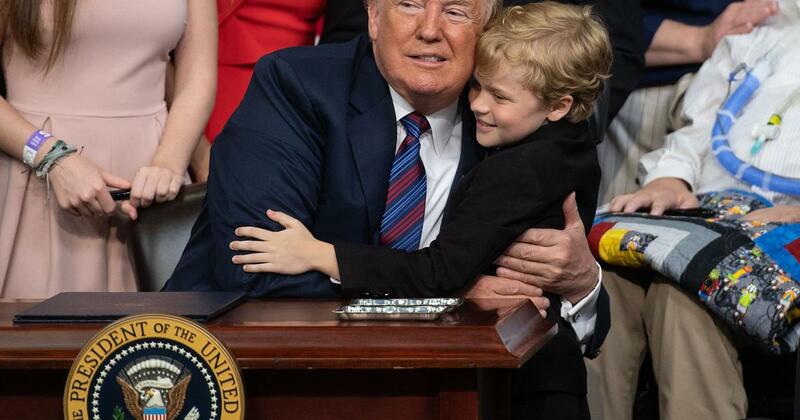 Eight-year-old Jordan McLinn celebrated the long-awaited moment by hugging the President . He has become the nationwide face of the campaign "Right to Trial" while fighting Duchenne Muscular Dystrophy. But the bill is not undisputed. Opponents argue that it is risky and does not give better access to drugs. Proponents like Jordan and his mother believe that it could be life-saving. When the President signed the bill, Jordan embraced. He missed the first few times, but finally they hugged each other. It was a hug of years in the making. Those with Jordan's genetic degenerative disease have an average life expectancy of about 25 years. "Seeing it finally finish was just this big achievement," said Laura McLinn. Jordan and his mother Laura were at the forefront of the movement to pass the "right to try" law, which allows the terminally ill, who have exhausted all other options, to gain access to medicines that are not yet completely by the FDA. CBS News met the McLinn family for the first time in 2015 when "right to try" came into force in their home state of Indiana through then-governor Mike Pence. "Unfortunately, it's empty symbolism," said Alison Bateman-House, an assistant professor of medical ethics. She fears that the bill gives false hope. "Nobody can force a company to give a drug if it does not want to," she said. "I'm not optimistic that this will be an access for patients." But Laura McLinn is still hopeful. "We've met so many people from different disease groups who can benefit from this law," said Laura. As for Jordan, he had a long day, but the meeting with the President was worth it. "He said my hair is very beautiful," Jordan said. Laura said Jordan is currently in the 65th week of a clinical trial. She said that they continued the "right to try" fight for others and Jordan who could still benefit from it. She believes that if a drug is safe enough for a clinical trial, it should be safe enough to use someone who dies.